Ueshiba Morihei-植芝盛平, (1883 14/Dec-1969 26/Apr) was a famous martial artist and founder of the Japanese martial art of Aikido. He is often referred to as Kaiso , O Sensei, meaning "founder", Pioneer. In Sep. of 1900, Ueshiba moved to To Tokyo and opened a stationery store. He briefly studied in Tenjin Shin'yō-ryū jujutsu under Tozawa Tokusaburō for a short period in 1901 in Tokyo. Two years later, in 1903, Ueshiba married with Hatsu Itogawa, a distant relative, in Tanabe and at the end of the year, he joined the 61st Army Infantry Regiment of Wakayama. Ueshiba is known to have studied several martial arts in his youth but he did not train extensively in most and even his training in Yagyū Shingan-ryū was sporadic due to his military service in those years. However, it was only after moving to the northern island of Hokkaidō in 1912 with his wife, as part of a settlement effort, that his martial art training took on real depth. For it was here that he began his study of Daitō-ryū aiki-jūjutsu under its reviver Takeda Sokaku. From June 1918-April 1919, Ueshiba served as town councilman in Kamiyubetsu village. In 1924, Ueshiba went to Mongolia with Onisaburo Deguchi with goal of establishing a utopian community. (February to July) The party, led by Onisaburo Deguchi, including Ueshiba, is captured and held prisoner by the Chinese military for plotting the overthrow of the existing government. Released after short period of internment through intervention of Japanese consulate and returned to Japan. In 1927, Ueshiba moved to Tokyo where he founded his first dojo, which still exists today under the name Aikikai Hombu Dojo. In 1932, Budo Sen'yokai (Society for the Promotion of Martial Arts) was established with Ueshiba as its first head and technical manual "Budo Renshu" published in 1933. 1938-1941, Japan occupied of the northeast of China, Ueshiba was Invited to instruct in Manchuria. In 1942, supposedly because of a divine command, he yearned to return to the farmlands. He had often said that "Budo and farming are one." The war had emptied the Kobukan, and he was tired of city life. Leaving the Kobukan in the hands of his son Kisshomaru, he moved to the Ibaraki Prefecture and the village of Iwama. Here he built an outdoor dojo and the now famous Aiki Shrine. Early on the morning of April 26th, 1969, O Sensei took his son's hand, smiled and said, "Take care of things" and died. Two months later, Hatsu, his wife of 67 years, followed him. O Sensei's ashes were buried in the family temple in Tanabe. Every year a memorial service is held on April 29th at the Aiki Shrine in Iwama. OSensei was a man of peace who followed his spiritual and philosophical vision. He taught that the martial arts should be used as a means to live in harmony with oneself, the earth, and its inhabitants. Throughout his life he continued to refine his system to the less violent and gently flowing techniques practiced today. Morihei Ueshiba was born in Tanabe, Wakayama Prefecture in Japan. Among five children, he was the only son of Yoroku and Yuki Ueshiba. Morihei was raised in a somewhat privileged setting. His father was a wealthy landowner who also traded in lumber and fishing and was politically active. From his father Yoroku, he inherited a samurai's determination and interest in public affairs, and from his mother an intense interest in religion, poetry and art. In his boyhood, Ueshiba was a weak, sickly child and bookish child. His father encouraged him to take up sumo wrestling and swimming and entertained him with stories of his great-grandfather Kichiemon who was considered a very strong samurai in his era. The need for such strength was further emphasized when the young Ueshiba witnessed his father being attacked by followers of a competing politician. Aikido is an art based on the fundamental concepts of harmony or blending, inner power, and the purpose of developing the practitioner. In fact, the name of the Aikido is made of these components :it came from a Japanese Budo (or Martial Way) and developed around the middle of the 20th century by O-sensei Morihei Ueshiba based on his many years and training in the classical Martial Arts and defined by his ethical and philosophical beliefs. Ai KanjiAi can be translated as harmony or blending. Ki KanjiKi can be translated as inner power, spirit or life energy. Do KanjiDo means a way or a path . There are many possible translations of the meaning of the name. Probably the most common translation is "The Way of Harmony with Spirit". In an early book, it was translated as "The Way of Chivalrous Spiritual Harmony". 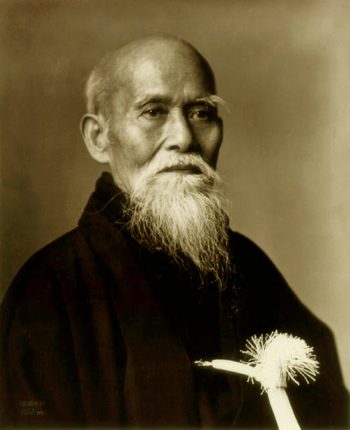 Aikido was developed by Morihei Ueshiba, he is also known by Aikidoka as o-sensei with the "o" prefix meaning "honorable", therefore signifying in this case, Honorable Teacher. the major parts of Aikido are derived from Daitō-ryū Aiki-jūjutsu a form of Jujutsu with many joint techniques, and kenjutsu ), or Japanese sword technique (some believe the tactics in Aikido are especially influenced by Yagyū Shinkage-ryū). Aikido is also considered to contain a significant spiritual component. Aikido was first brought to the West in 1951 by Minoru Mochizuki with a visit to France. It was introduced to the United States in 1953 by Kenji Tomiki and, a little later in the same year by Koichi Tohei. The United Kingdom followed in 1955, Germany and Australia in 1965. Today there are many Aikido dojos available to train at throughout the world.